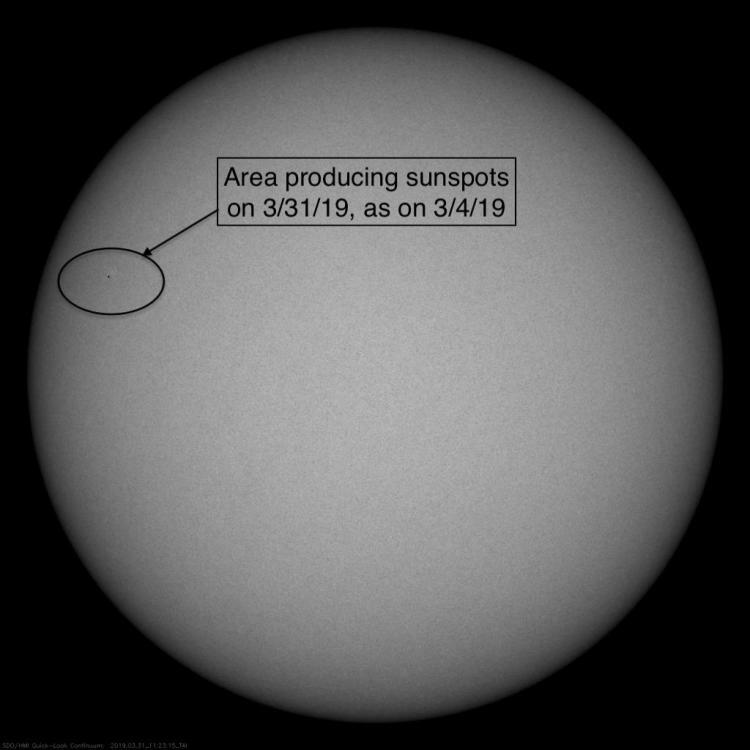 Yesterday (on February 13, 2019), a small sunspot emerged on the solar disk. The 'official' sunspot counters in Belgium counted the spot, http://www.sidc.be/silso/eisnplot . 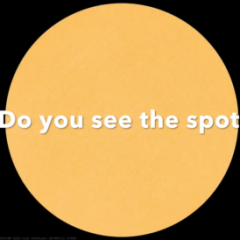 However, space weather sites (e.g., spaceweather.com, sunspotwatch.com) did not acknowledge the spot. Neither did spaceweatherlive.com. Why is that? 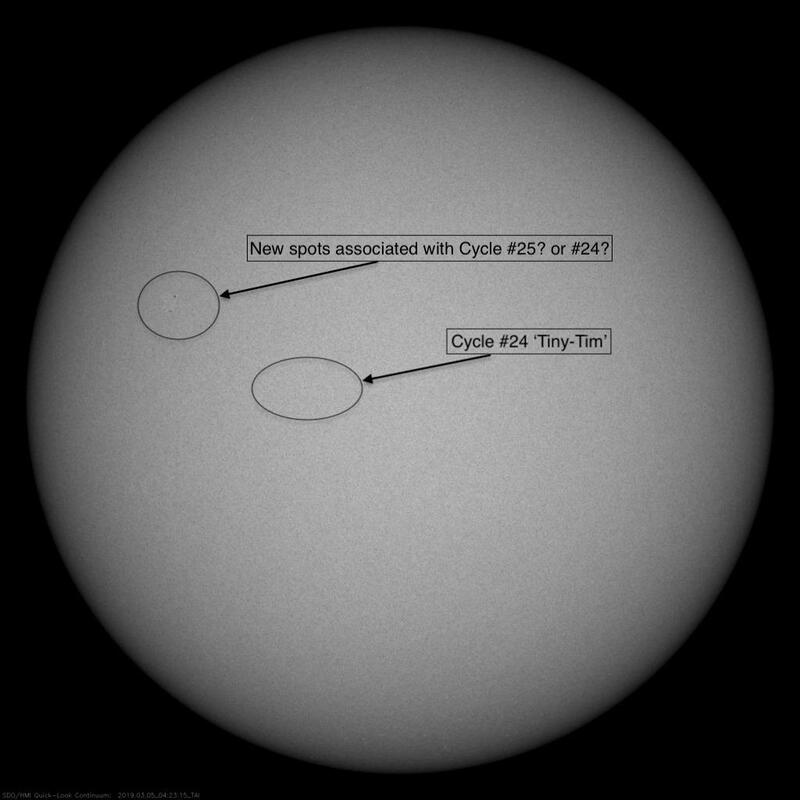 Yesterday's sunspot appeared to be associated with Cycle #25, as explained further here: https://www.youtube.com/watch?v=wr9HiIClSVM . The sunspot number is determined by the SIDC, the sunspot regions are determined every midnight UTC by SWPC. If at that time that small region hasn’t been observed it won’t be acknowledged as an official region. If that region would last one more day it would get numbered eventually but as with every new region it depends on when it has emerged. New cycle regions will appear more frequently as the sc24 ends. Another good site is Jan Alvestadʼs Solar Terrestrial Activity Report (“STAR”), which provides a rigorous numerical summary and descriptive analysis, including his own region designations/spot counts, alongside government published data. Attached is an image of the HMI Intensitygram snapped at "midnight UTC" (per Vancanneyt Sander's post above) which still shows a sunspot in the subject area, albeit it is quite faint by that point. Thanks for the tip, Kaimbridge! The STAR is indeed a very good reference too, it also knows that NOAA isn't always that right and has it's own analysis and region designation as @Kaimbridge already noted. I always check them out for extra info so keep it in your bookmarks. 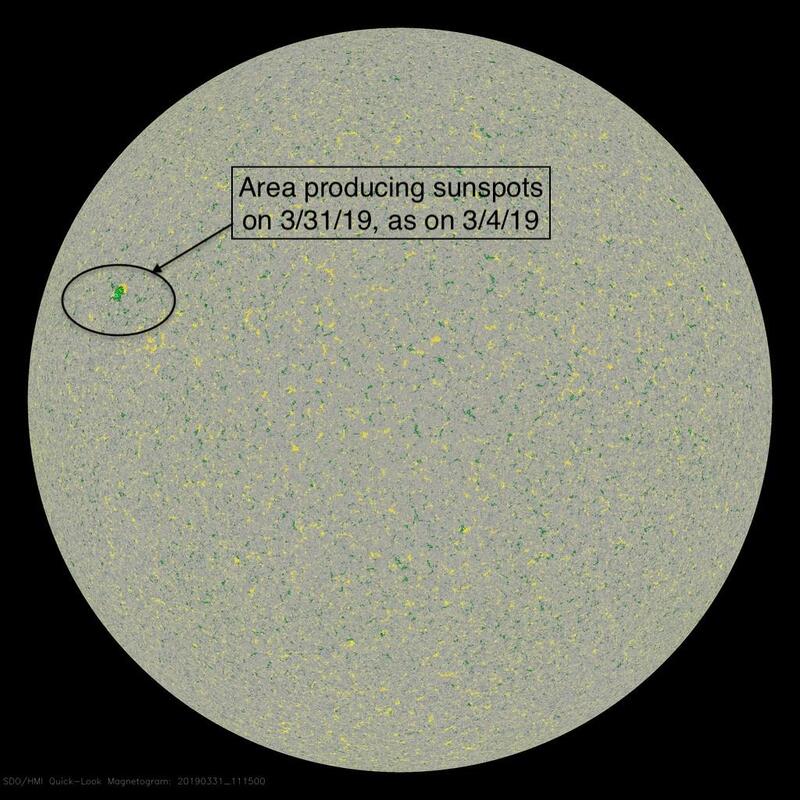 A new sunspot near the equator, associated with Cycle #24, emerged on the solar disk today, and another area, currently possessing more north-south polarity alignment rather than east-west alignment, formed in the Northern Hemisphere. The area of the Cycle #25 sunspot that briefly emerged on Feb. 13 has come back around the eastern limb, and appearing a bit larger now; it will be interesting to see whether it produces longer-lasting sunspots, going forward. In the attached photos I've highlighted the areas discussed. Hi, thanks for your work. Is very Good. Can this be considered a new sunspot? 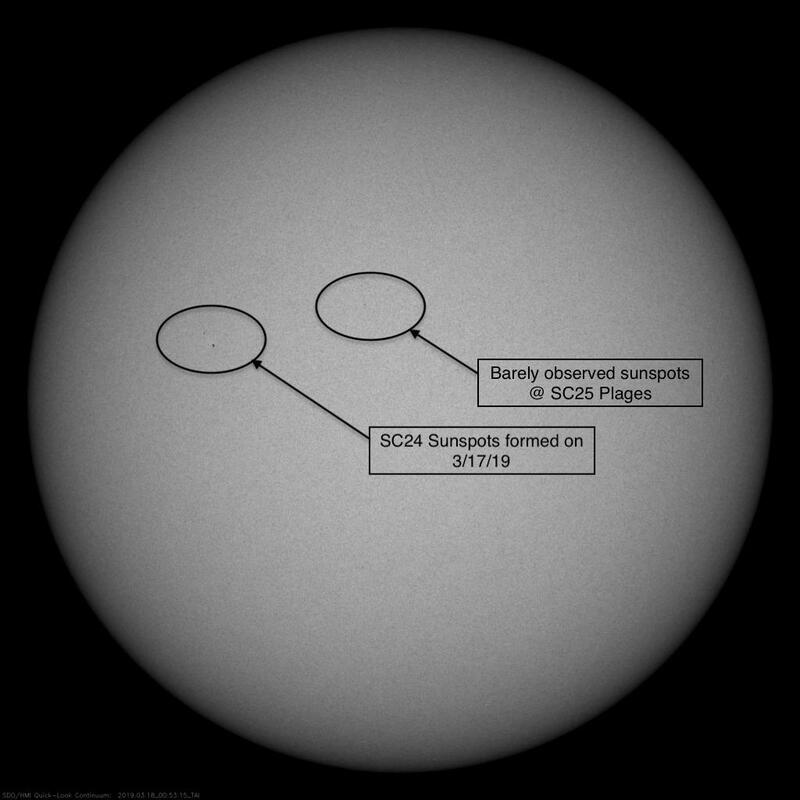 Vancanneyt Sander, new SC24 sunspots formed by 16:00 today, 3/17/19. Let's see if SWPC acknowledges them if they are still there by 00:00, 3/18/19. Or did you mean they have to remain for over 24 hrs, in addition to existing at midnight UTC, in which case, they would still have to exist by 00:00, 3/19/19 (i.e., a duration of over 30 hours in this particular case) in order for SWPC to acknowledge them? On closer examination, the plages I've labeled as SC25 in the above images, may actually be associated with SC24. When do most models have Cycle 25 activity increasing? One I looked at looked like late 2019. Welcome James. I did not do all that much research to be honest about this but this is all I can tell from what I know. The SIDC has two models which you can find on the website. https://www.spaceweatherlive.com/en/solar-activity/solar-cycle. One calls for a solar minimum pretty much this month with a sharp onset later this year with a very short minimum (which could indicate a SC25 that is likely stronger than SC24) and one model with a slow onset beginning in 2020. The source of the plotted data was from here: http://www.spaceweather.gc.ca/solarflux/sx-5-en.php . Note, the F10.7cm data plotted in the last graph above was averaged over the Carrington Rotation, as compared to the daily flux values plotted in the previous two graphs. Higher resolution images of the previous two plots are found here: https://imgur.com/sGApbi5 , https://imgur.com/EHwo3ty . SWPC has numbered the region, so that would mean that after midnight it will be in the sunspot list. 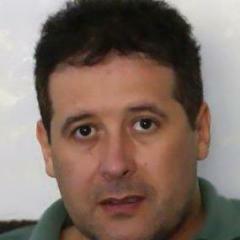 The current prediction model of SILSO (SIDC) has indeed a few models as Marcel has explained. There is no prediction yet for the full cycle, we do not know if a committee will be called together as there was with SC24. 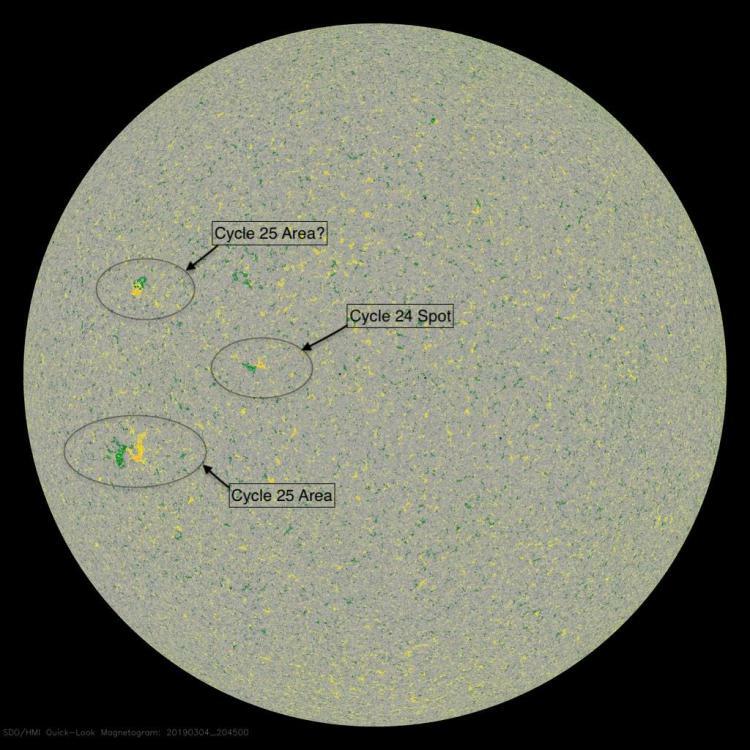 Currently there is no signs of a grand solar minimum and it also can't be predicted. At the end of SC23 some voices already said the same thing as there is now so nothing has changed . Also, not only sunspots are an indicator of the cycle so the models always use several methods. And each model has a bit of different output which led to big discussions with the SC24 prediction in the past (that's why the SC24 prediction had two predictions: low solar max and high solar max to be short). Abstract "Our model successfully reproduces three independent data sets: total solar irradiance measurements available since 1978, total photospheric magnetic flux since 1974 and the open magnetic flux since 1868 empirically reconstructed using the geomagnetic aa-index. The model predicts an increase in the solar total irradiance since the Maunder Minimum of 1.3 Wm2"
In therms of solar irradiance you can see at the end of the graph the modern maximum that since cycle 15 occurred. Also clearly the Dalton minimum shortly after the year 1800. As of current solar irradiance we are still in the modern maximum ages so it’s pretty doubtable we would be heading towards a grand minimum. Among climate scientists, is there even agreement as to how cold the planet was during the "Maunder Minimum"? I ask the question because Steven Belcher is on record stating the "little ice age in the Middle Ages...(was) probably just a European phenomenon; there's no evidence that that occurred in other parts of the world so it's not a global ice age it's just a local deviation". The model predicts an increase in the solar total irradiance since the Maunder Minimum of 1.3 Wm2"
Thank you Emilio Petrozzi. The major takeaway from the work you cited is this: Total Solar Irradiance (TSI) has only increased by 0.096% since the Maunder Minimum. If the sun has been that extremely consistent in its TSI over the most recent centuries, does it not follow that any dramatic changes in weather/climate occurring here on earth in recent times have to be almost solely attributable to what is going on with planet earth, rather than trying to blame these changes on 'sun changes' that simply are not happening? Co2 increase and of course Hfcl and Other hydro flouro carbon combinations. Waiting 30 hours for sunspot registry is smart because it gives a valuable length of Solar irradiance to measure, if the spots last over 24hours and returns on the limb, then you can bet that there will be a small if not marginal short term effect on weather phenomena to a "cummaltive end"😆 Being able to predict WHEN the spots will return is the Big Fish! You guys are way smarter than me!! 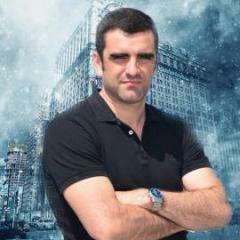 Thank you Emilio Petrozzi. The major takeaway from the work you cited is this: Total Solar Irradiance (TSI)﻿ has only increased by 0.096% since the Maunder Minimum. "The Sun is the predominant source of energy input to Earth. Solar radiation ensures the maintenance of the appropriate range of temperatures for the sustenance of life on Earth, by driving land surface heating, plant productivity, and oceanic and atmospheric circulations. It is also the main driver for several water cycle processes, ranging from evaporation and cloud formation to precipitation, although it can also introduce certain adverse influences, such as harmful ultraviolet radiation and production of ozone through photochemistry. Because of the Sun’s dominant influence on Earth’s function, it is important to accurately measure the solar input to Earth or solar irradiance. I think the precise figures still need to be quantified. Emilio, the paper you cite backs up what has already been quantified. NASA started taking the accurate evaluation of TSI very seriously in the *mid-1960's, when they wanted to better understand temperature discrepancies they were observing in spacecraft back then (*sorry, I don't have the citations immediately at-hand). The key point we hopefully can come to a better understanding and agree upon (based on apolitical, unbiased-scientific principles), is that the 'solar constant' really IS pretty constant, varying less than 0.1% over the solar cycle. Consequently, any significant changes in "land surface heating, plant productivity, and oceanic and atmospheric circulations", are NOT due to changes in the sun's TSI, because the sun's TSI is simply not changing that much. Do we agree? Evidence for the climate influence of solar cycle irradiance changes is apparent in surface and atmospheric temperatures (Lean 2010; Gray et al., 2010). Global surface-temperature increases of about 0.1°C are associated with irradiance increases during recent solar cycles, with larger regional changes occurring in some locations (Lean and Rind 2008). The Sun changes its activity on time scales that vary from 27 days to 11, 22, 80, 106, 212 years, and more. A more active Sun is brighter due to the dominance of faculae over cooler sunspots, resulting in increased solar irradiance. The amount of change of solar irradiance, based on satellite measurements since 1978 during the course of an 11-year cycle, is only 0.1% (Willson and Hudson, 1988), causing many to conclude that the solar effect is negligible. Cycle 23 has declined 0.15%. Over long cycles since the Maunder Minimum, irradiance changes are estimated to be as high as 0.4% (Hoyt and Schatten, 1997; Lean, 2000; Lockwood and Stamper, 1999; Fligge and Solanki, 2000). However, this does not take into account the Sun's eruptional activity (flares, solar wind bursts from coronal mass ejections, and solar wind bursts from coronal holes), which may have a much greater effect. This takes on more importance since Lockwood et al. (1999) showed how the total magnetic flux leaving the Sun has increased by a factor of 2.3 since 1901. This eruptional activity may enhance warming through ultraviolet-induced ozone chemical reactions in the high atmosphere or ionization in higher latitudes during solar-induced geomagnetic storms. In addition, Svensmark (2007), Palle Bago and Butler (2000), and Tinsley and Yu (2002) have documented possible effects of the solar cycle on cosmic rays and through them, the amount of low cloudiness. 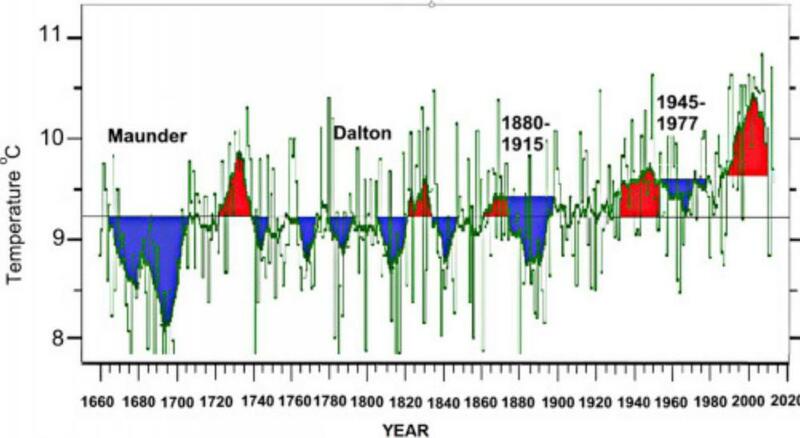 A number of authors have observed that periods of low solar activity, such as the Maunder minimum, correspond to cooler periods in the past (e.g., Eddy, 1977; Lean et al., 1995). As minor variations in radiocarbon production seem to be related to solar activity, it has also been argued that 14C variations are inversely related to worldwide temperature fluctuations (Wigley and Kelly, 1990). This implies that solar activity, radiocarbon variations, and surface temperature are all related, perhaps through fundamental variations in the solar constant (i.e., low solar activity = high 14C production rate = low temperature). If so, then the 14C record itself, as a proxy of solar activity, would provide important information on the causes of climatic change, and indeed, many investigations have simply used the record of 14C or 10Be variations as a proxy for solar irradiance (e.g., Magny, 1993; Bond et al., 2001; Hodell et al., 2001; Neff et al., 2001). Earlier in this thread, I submitted images on March 4 of the area producing sunspots again today (shown in the attached image). The Belgium sunspot counters (http://www.sidc.be/silso/eisnplot) have not yet acknowledged the spot @1214 UTC. To clarify, this is the area I labeled "Cycle 25 Area?" and "New spots associated with Cycle #25? or #24?" in a couple of the images posted earlier on March 4. It was later known as AR2734. Beautiful post Artist thank you! And thanks for all of the information. Here. That sun sure throws a surprise every now and then, I've learned not to take myself to seriously when making predictions, your careful observations are excellent, and will prove to be the best way to understand our star, careful, daily observations. Great work everybody !! thank you.